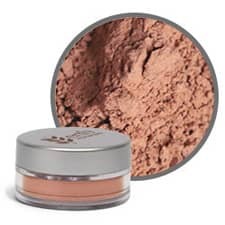 Erth Minerals Bronzed Bronzer is an all natural medium tan mineral bronzer with yellowish/orange tones and a nice bit of sparkle. Mineral bronzers extend the life of your natural tan, or give you that sun-kissed look without the damaging effects of UV rays. Applies evenly and smoothly and works well with a variety of skin types. Works beautifully as all-over-face color, or as spot bronzers for a natural, sun-kissed look. Can also be mixed with Erth mineral foundations in order to deepen color for the warmer seasons! It is very concentrated, so very little is needed. For a natural look, apply Erth to those areas of your face that the sun normally hits- the tip of your nose, the cheek, and the chin. For an all-over-face color is desired, apply very lightly adding layers to darken color. Erth Mineral bronzers are best applied with ultra-soft highlighting brush.